I visited Mike Isabella's Graffiato shortly after it opened in 2011, and since then, the Top Chef alum has been busy growing his profile. 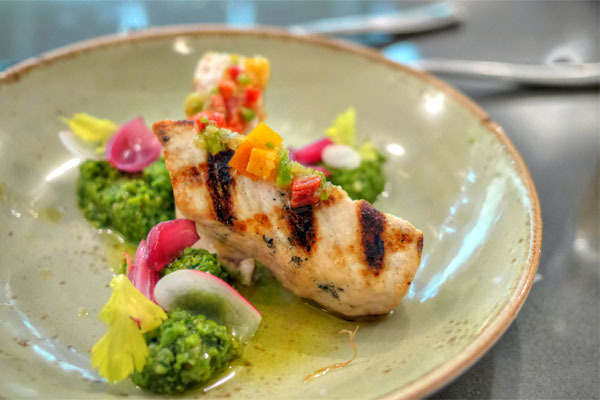 In March 2012, he was named "Best New Chef" of the mid-Atlantic region by Food & Wine, and helped open Mexican small plates concept Bandolero with Jonathan Umbel shortly thereafter. 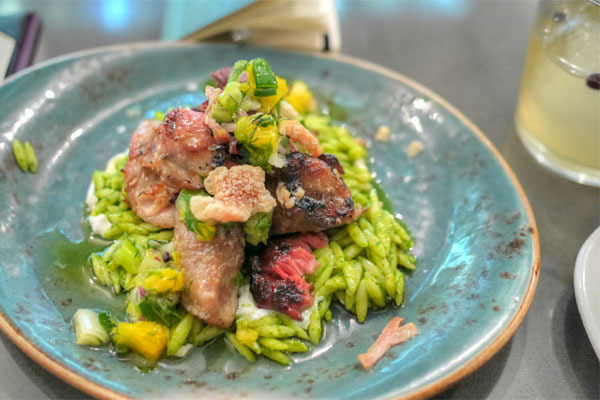 That September, Isabella became an "American Culinary Ambassador," and also released his cookbook, Crazy Good Italian: Big Flavors, Small Plates by Mike Isabella. 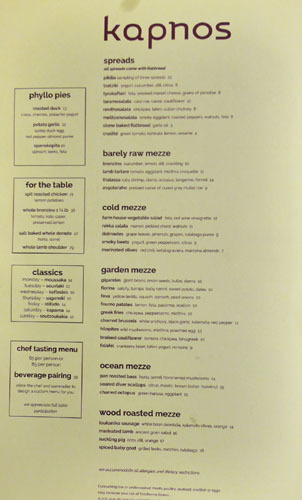 2013 saw the Chef expand to New Jersey with G Grab and Go and participate in Top Chef: The Cruise before leaving his post at Bandolero and launching Kapnos and its attached G Sandwich. 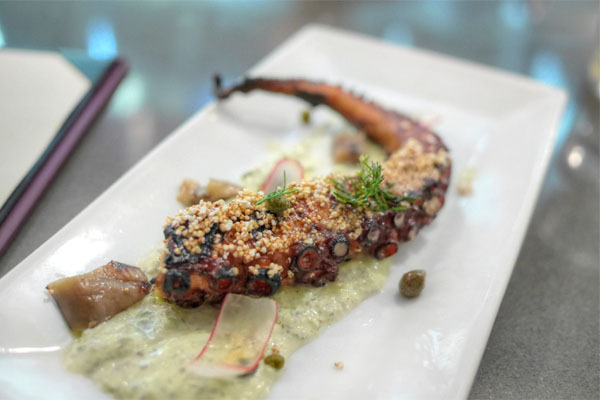 This latest restaurant features cooking influenced by the cuisine of Northern Greece, and represents a bit of a return to the type of food he was doing during his days at Zaytinya. Joining Isabella here are Chef de Cuisine George Pagonis, GM Nicholas Pagonis, as well as Bandolero/Graffiato alums James Horn (Wine & Service Director) and Taha Ismail (Beverage Director). 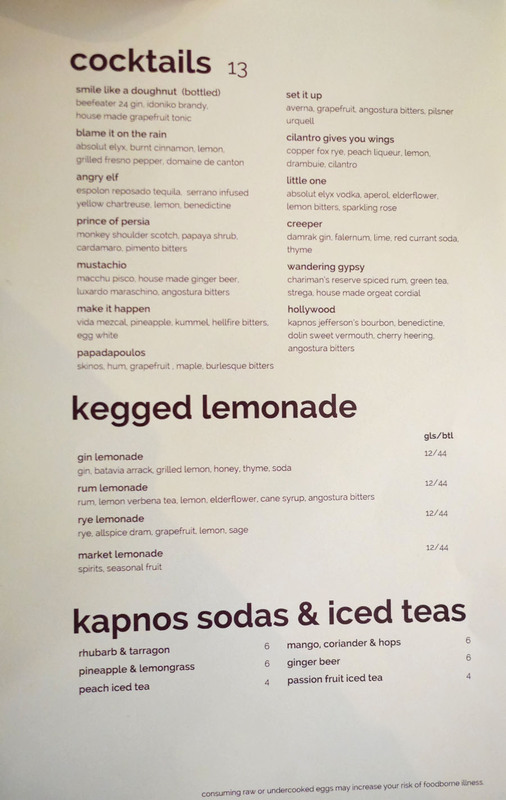 Kapnos' menu features a variety of mezze (small plates, basically), with particular attention paid to items coming off of the restaurant's multiple wood-fired grills, including whole animal carvings. 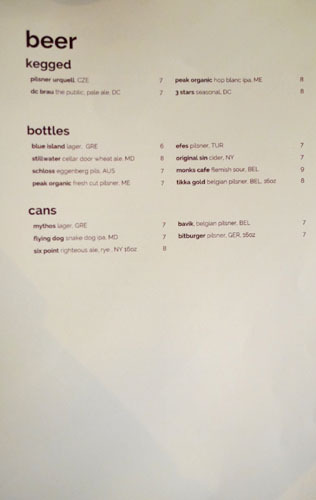 There are also tasting menu options at $65 and $85, the latter of which I opted for this evening. Click for larger versions. To drink, think cocktails from Taha Ismail, some beers, and a fairly lengthy wine list with an appropriately large selection of Greek varietals. Click for larger versions. Kapnos was penned by the Bethesda-based firm Streetsense (they also worked on The Red Hen), though I didn't get to admire much of the decor, as I chose to take a seat at the kitchen bar. 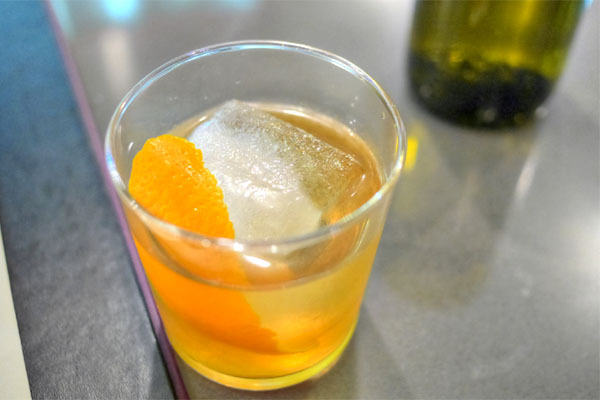 Cocktails were definitely called for tonight, and my first was a hit with its combination of sweet 'n' spicy flavors over a well-tempered base of whiskey, finished with an almost tingling sensation in the back of the throat. 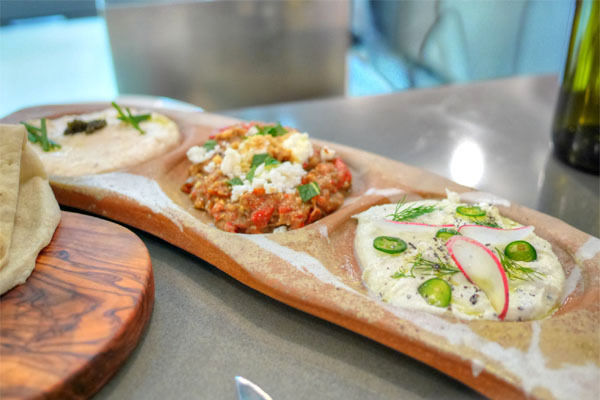 My first course was a trio of dips, served with a super fluffy, soft flatbread that was among the best I've had. Going back to front, we have the taramosalata, which showed off a wonderful brininess moderated by the bits of chive on top. The melitzanosalata, meanwhile, had a great combo of smoke and sweetness, augmented by the salty feta and pricks of mintiness. Finally, the tyrokafteri I liked too, with its lactic tang, creamy-yet-gritty consistency, and bright bits of greenery on top. Overall, a delicious way to kick things off. Along with the spreads came some crudités, also among the best I've had, a blend of smoky, nutty, and tart flavors over some marvelously crisp textures, accented by just the right amount of citrus. 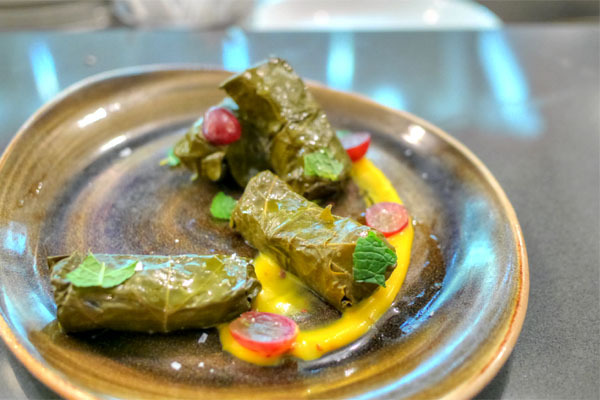 I'm not a fan of dolmades in general, but Kapnos' were surely among the stronger preparations that I've tried, dense, tightly-packed nuggets of nutty, ricey, sweet nuances encased in richly-flavored leaves. 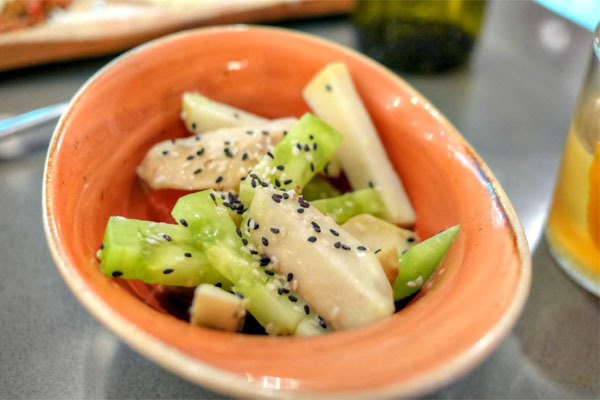 My favorite element here was the use of grape, which added some delightfully juicy pops of fruitiness to the fray. 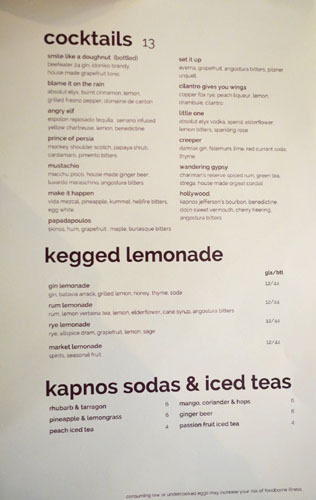 I made sure to try some of Kapnos' kegged lemonades, and the version featuring rye came recommended by my server. 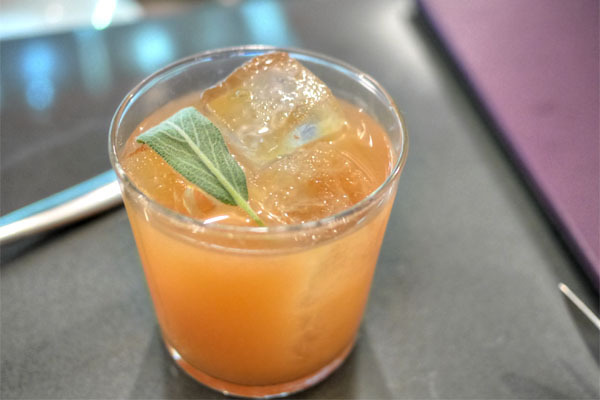 It fit the bill nicely, giving off a balanced, citrusy quality over a base of the booze, the sage adding a lovely aromatic component to things. 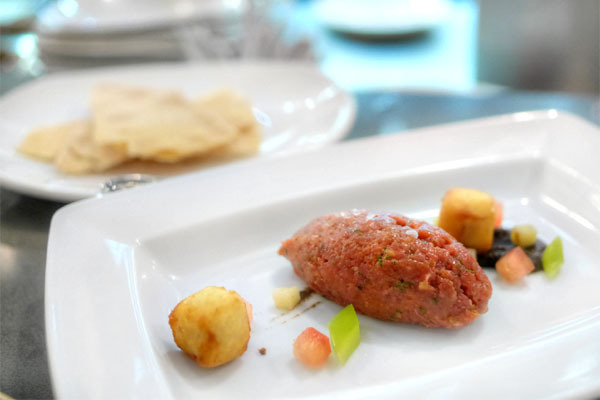 The tartar was likened to a deconstructed moussaka, and was really quite fetching, giving off a subtle combination of savory, spicy flavors that paired great with the crunchy chip, all while cubes of mizithra cheese gave the dish yet another delectable dimension. Swordfish was the lone off-menu item on the tasting, and was a surefire winner as well. It was one of the juiciest preparations I've had, a dense fish just loaded with flavors of brine, savor, and char. I was a big fan of the veggies here too, not to mention that harissa, which really tied it all together. Octopus is ostensibly one of the Chef's favorite things to cook with, and indeed the ingredient was done justice tonight. Just think super tender, and beautifully charred, a perfectly on point tentacle smartly evened out by the cooling sauce. 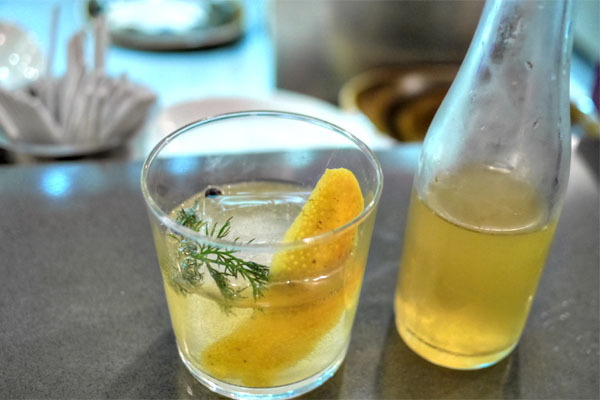 My final cocktail was akin to a bottled gin & tonic, a delightfully bright, herby, citrusy concoction with flavors that melded seamlessly. 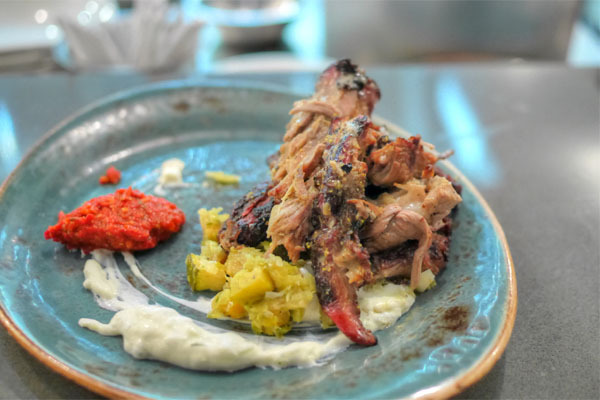 At this point, we moved on into the whole animal preparations, and Kapnos' goat really hit the mark, giving me boatloads of earthy, satisfying flavors made even better by the multitude of crispy, caramelized bits. Some lovely counterpoints from the chili paste and yogurt, too. The suckling pig made a strong case for itself too, arriving decadently flavored and superbly spiced, accented by the crunchy bits of fried skin while the combination of orzo and dill helped subdue the entire experience. Yum. I was already burstingly full by this point, but dessert was a must. 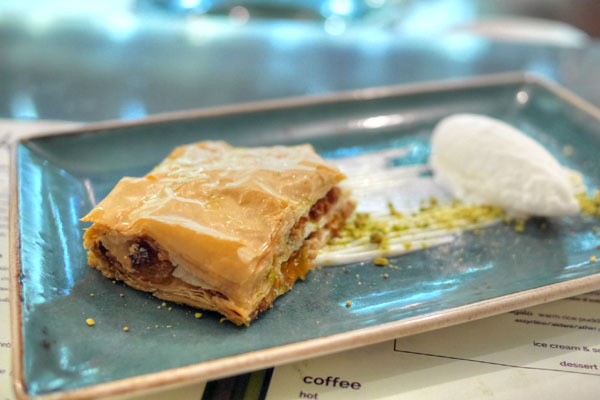 The baklava was a fairly traditional version, rich and flaky, but with a strong stone fruit character and an excellent accompaniment in the form of that rosewater ice cream. 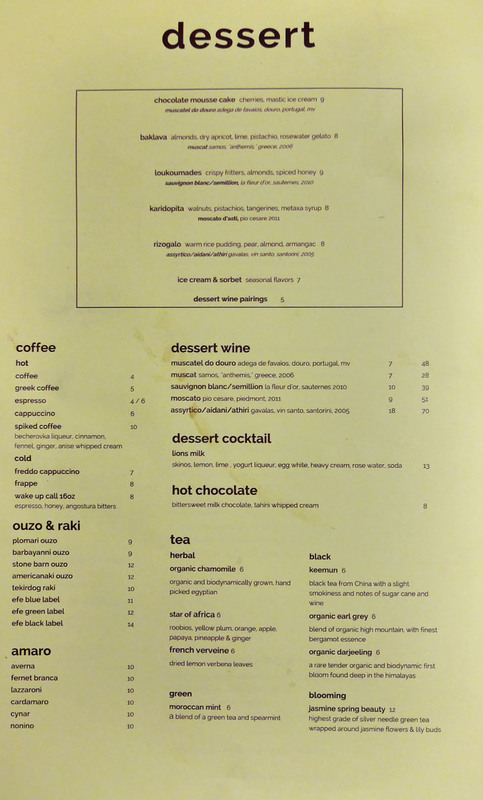 I enjoyed my time at Graffiato, so I expected to have a good meal here, but the experience managed to exceed my expectations. 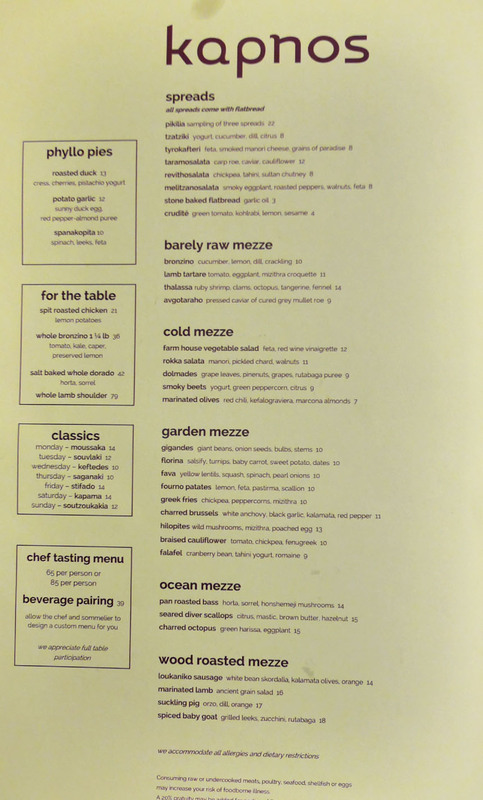 The food reminds me of what the Chef was doing back at Zaytinya, but with more bravado, less restraint. It's almost like the type of cooking Isabella would've done at the old restaurant had he not been under José's wing. 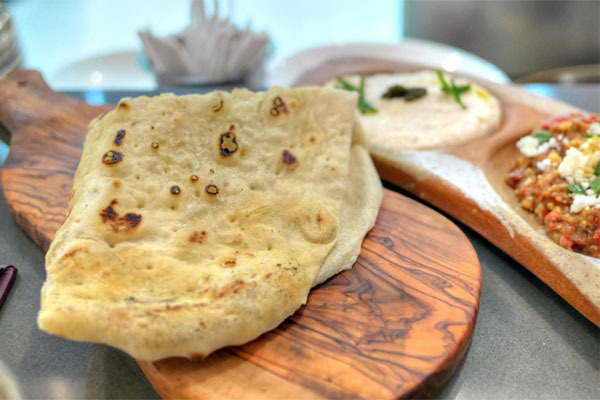 Overall, Kapnos is more than a fitting follow-up to Graffiato. As for what's next, the Chef is showing no sign of slowing down. He just opened another location of his G sandwich shop at Nats Ballpark, which is to be followed by Kapnos Tavern in Arlington. Next is another Graffiato down in Richmond, and after that, who knows. Kevin- Love your thorough reviews! I'm wondering if you might be able to offer some suggestions about a special splurge dinner in DC in about 2 weeks. I don't think I can get a res at Komi or Seasonal Pantry at this point; but was thinking CityZen (which it doesn't look like you've been to), Sushi Taro, Menu-MBK, or Rogue24 (though issue being that I think 24 might be a bit too much and take too long-- looking more at the 5-10 course range but worried that 10 will be too little here). I'm looking within $300 including tax and drinks for 2. My dining partner is less adventurous than I am so maybe middle of the road would help. Any thoughts on which was just most memorable? Thanks so much! I actually went to CityZen years ago, before I even started blogging. Of the choices you mentioned, that's probably what I'd pick. 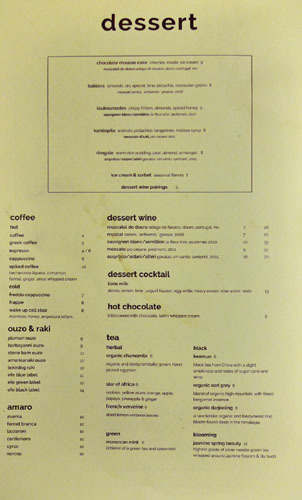 If you're dining companion's more of a picky eater, then Sushi Taro and Rogue 24 might be pushing it. Also, Taro's omakase counter would probably go over budget, and for Rogue, you really should be doing the 24-course if you're going there. Phòng khám chuyên khoa tiết niệu Dr Đông Hưng - http://drdonghung.vn/ - Chuyên dịch vụ thẩm mỹ nam khoa, thẩm mỹ phụ khoa, điều trị bệnh nam khoa, phụ khoa, bệnh xã hội an toàn, uy tín, thẩm mỹ.